Are you hunting for a supplier of pure cotton labels to be sewn on the outside bottom hem of designer baby and kids clothes? Cotton label is a perfect clothes label for kids clothing and lifestyle brand garments; cotton label is soft, strong and sustainable label material. 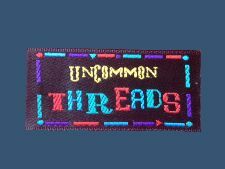 Here at Perfect-Labels-Lanyards, we provide custom-made stylish cotton labels, and they are made of 100% pure cotton fibre. The printed cotton label that we provide is 100 % pure cotton. 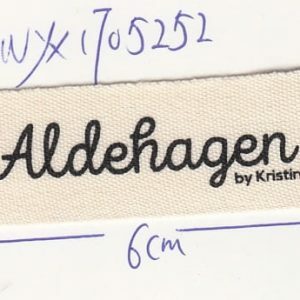 The custom-made woven cotton label is only 100% cotton on its base fabric; the reason for this is that cotton threads are too soft, and that they are not flexible and strong enough to weave the logo or any design pattern. The best and simple way to find out if it is a 100% cotton label is to do a burn test. Please be careful, and keep in mind of safety precautions when you plan to do the burn test. The way that a natural fiber burns, such as 100 % cotton label, it ignites and burns quickly; the smoke from a burnt 100% pure cotton fibre is white, and it smells like a burnt paper. The burn test that carried out on a synthetic, artificial fibre such as polyester label, it ignites and burns quickly as well, but the fibre may shrink and leaving a hard plastic-like black burnt ball on the edge, and it produces black smoke. Please email us your vector design file (PDF or Jpeg format) for a quote. If you place an order with us, then you will see your custom-made sample and approve it before bulk production. Contact us today, our contact details are here.